Home 2017 February 2 Save the Bees! The topic I am interested in researching is the decline of the bees. I know that the number of bees is declining quite quickly and I wanted to know what we can do to stop it. I believe that keeping our environment safe and healthy is an important thing to do and the bees are a very important part of our world. So far, I know that pesticides and overworking the bees is contributing very much to why they are disappearing, but I want to know more. 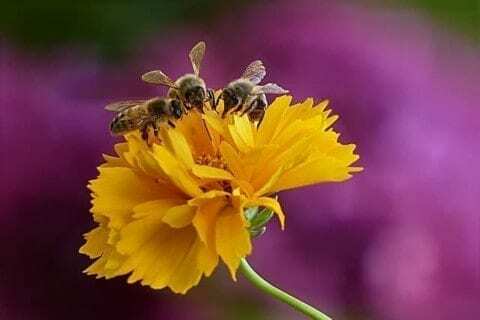 An article from Greenpeace says that the main reason for bee-decline is linked to industrial agriculture, parasites/pathogens and climate change. To help save them, they say to stop chemical-intensive industrial agriculture and to shift towards ecological farming. Another article from Natural Living Ideas gives us a few ways to help the little critters live on. They say to plant bee friendly flowers and shrubs. By doing this we keep them in a safe area as well as making some plants happy. They also say to buy only local honey. We do this because local beekeepers are much more likely to take good care of the bees and care for their health. Another great way to save the bees is to set up a bee refreshment station. This helps tired bees, that might not have enough energy, find fresh food and water. Save the Bees! by Anna is licensed under a Creative Commons Attribution-ShareAlike 4.0 International License. Anna, I quite like your post. While I agree that saving the bees is important and good for the world, I can’t say that I am very excited about personally planting shrubs that will attract the little monsters. Alas, the environment wins. Nice post. What and interesting topic, I really enjoyed reading about it, those poor bees. While reading this I instantly thought about the Bee Movie, if you have seen it, it reminds me of the part of when the bees don’t have to work anymore supplying pollen to the flowers and making honey. The animated world in the movie was depicted as gloomy and without beautiful trees our flowers. As humans it is important to take responsibility for our actions. If bees continue to die off the world will become I would like to say like the movie, and it won’t be because they aren’t working. It’s crazy how much bees help our environment.